Three former UK bankers are being extradited to the US to face charges connected with the collapse of Enron, in a case which has put the spotlight on Anglo-American legal procedures. 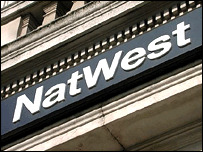 The trio are alleged by the Enron Task Force to have "deprived" NatWest in the UK of millions of pounds after a deal in 2000 involving a Cayman Islands limited partnership. It is claimed David Bermingham, Gary Mulgrew and Giles Darby, in partnership with Enron's then-chief financial officer Andrew Fastow and global financial chief Michael Kopper, deceived a subsidiary of NatWest to line their own pockets. However, although the alleged perpetrators and victims are based in the UK, the Crown Prosecution Service has not brought any charges against the three. The men have called on the UK's Financial Services Authority (FSA) to bring charges against them, but say the FSA has not done so. They have also written to NatWest asking them to bring civil proceedings against them "if you consider we have committed an offence", but say there has been no action and the bank is still providing financial services to them. Instead, the US Department of Justice has brought seven indictments of "wire fraud" relating to the deal, covering emails and faxes sent between Houston, London and the Cayman Islands four years ago. Each indictment carries a maximum of five years, meaning a possible sentence in Texas of 35 years. As well as the Enron connection, the proceedings have attracted attention because they are the first to have been brought under Part 2 of the new Extradition Act 2003, which came into effect this January. The new act has been attracting attention from civil liberties groups, because of changes from the previous act. Part 1, covering seven EU countries, removes the need for an evidential burden. Part 2 (non-EU countries) keeps the burden, but 42 countries, including the US, have been granted a fast track process by the UK, which allows them to provide "information" rather than "prima facie evidence" a crime has been committed. The three men want an action to be brought in the UK - by the FSA, Serious Fraud Office, or NatWest - as a means of proving what they say is their "total innocence". However, their attempt to have the case heard in the UK was thrown out by the highest court in the land - the House of Lords - while a final appeal to the European Court of Human Rights also failed. Earlier this month, the attorney general also rejected calls for the three men to be tried in the UK rather than the US. Lord Goldsmith said he saw no basis for the Serious Fraud Office to re-consider its decision to leave the ex-NatWest bankers' case to the US authorities. The decision came despite the shadow attorney general warning that the men's extradition threatened to bring the criminal justice system into disrepute. In February the High Court rejected their appeal saying it would be "unduly simplistic to treat the case as a domestic English affair". The decision backed the original ruling in June last year. At the preliminary hearing in London District Judge Nicholas Evans held that the Texan-based charges covered valid extradition offences. He said: "The fact that each of these defendants are United Kingdom nationals, living and working in England, and that it was a United Kingdom bank which suffered the loss, does not matter." Alun Jones QC, counsel for the bankers, had expressed concern about relations between the US and UK authorities under the terms of the Extradition Act, and the fact it does not require the US to produce evidence of crimes alleged. The three are accused of defrauding former employer, Greenwich NatWest, the capital markets division of NatWest, by secretly investing in an "off-balance sheet" Enron partnership. American prosecutors say the trio worked with Michael Kopper to convince Greenwich NatWest to sell its stake in the partnership for $1m (£560,000) when it was worth much more than that. The indictment, lodged in the Southern District of Texas district court, says the partnership was then quickly sold for $20m, with the British collecting about $7.3m in profits between them. The men, who have been free on bail since their arrest in the UK in April, deny all the charges. They point out that when the Enron scandal first broke in 2001, and before any criminal investigation into the company, they went voluntarily to the FSA, and gave details of their contacts with Fastow and Kopper in a taped five hour interview. "We did not run straight for our lawyers, or decide to say nothing," said David Bermingham. "We have requested British authorities to bring a case against us if there is one to answer." After their extradition the three will be placed in a US jail for up to 18 months before trial, have to conduct their defences - using separate counsel - from custody. They say they could be bankrupted by the costs, none of which would be recoverable, even if declared innocent. 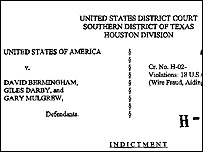 The arrest warrants for Messrs Bermingham, Mulgrew, and Darby were issued in June 2002, and since then Fastow and Kopper have agreed to co-operate with prosecutors. Kopper was the first Enron executive to admit guilt and pledge cooperation with federal prosecutors. He pleaded guilty to charges of money laundering and wire fraud. Fastow was initially indicted in October 2002 and the charge sheet eventually ran to 98 counts of fraud, conspiracy, money laundering, insider trading and other offences. He pleaded guilty to two counts of conspiracy in January this year and is also "co-operating" with US prosecutors.